The next eagerly anticipated Sound Approach title is here. 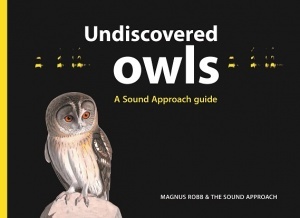 This ground breaking book focuses on the owls of the Western Palearctic, North Africa and the Middle East and explores the vocal ranges of 38 different species. Magnus Robb invites you into his and the owls world with beautifully written stories and tales of the unexpected. Our new book, which has been three years in the making, has seen the Sound Approach team journey from the extreme cold of northern Europe, waiting cold and hopeful for Hawk Owls, to the hot and humid mountains of the Middle East, where amazing discoveries awaited them. Let Magnus draw you into a world of mystery and darkness with 327 digitally recorded sounds from some of our best-loved bird species. Learn about the owls you’ve admired for years, and others you may never have seen or heard of before.